Yesterday it was reindeer, so today we will have a sleigh! Isn’t that beautiful? 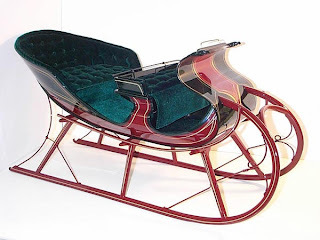 There actually is a company, called Sugarloaf Mountain Sleighs that makes “real live” sleighs for people to use (wouldn’t do me much good here in L.A., but it would be cool to have something like this in a rural location in a snowy region). Sugarloaf Mountain Sleighs is located in Pennsylvania, and I wonder if the Amish buy sleighs from them? Probaby not, as these are too pretty for the Amish, but the Amish strike me as the perfect people to use something like this. But wouldn’t it fun to ride across snowy hills and dales (to grandmother’s house!) in something like this (assuming you had the horse and all)? It takes my imagination back to quieter, more peaceful times. Of course, I’m not against snowmobiling! But this seems romantic. Does anyone here subscribe to GoodWord? One of our school librarians turned me on to this and I have subscribed ever since. Every day you get emailed a word, its pronunciation (which you can hear), its use in conversation, and its derivation. It’s the derivation part that I like the best. It probably goes without saying, but there is a lot of wisdom located inside of words, and if a person wants to keep learning, understanding words themselves is probably a good place to start. Today’s “good word” was “sleigh,” and it was that site that had the link to the Sugarloaf Mountain site. I feel much better after what might have been a somewhat mournful post yesterday. Well those moods do come upon us, sometimes (and lots of times around Christmas), but I snapped out of it. I opened a box of Christmas gifts sent to me by my good friend Donna, and among some great books and music, she tucked in some Crabtree & Evelyn shower gel, after shave balm, and soap, all in a manly scent called “Nomad” (which I still am, a nomad, although perhaps more in spirit now than in actuality). I don’t really know how to handle shower gel, I guess you just squeeze some on a natural sponge and scrub away. That’s how I used it, anyway, as a special “perk me up” treat. With that and the after shave balm that I used afterwards, I was surrounded by a very subtle masculine fragrance that made everything seem wonderful. I’m going to treat myself to some of it today, again, after I post this. I haven’t showered yet, today…I just had a breakfast of blueberry waffles and, sorry to all those health nuts out there, but I used only white flour this time, so that, too, was a special treat. (I normally put in half or three-quarters whole wheat flour, but I happened to be out of it, so I gave myself an indulgence.) WITH butter and real maple syrup, thank you very much! (I probably would have loved to have gone in a sleigh to get some maple sap up in a forest in Vermont. And if the butter had been churned from freshly-drawn whole Jersey cow milk…. Okay, let’s not go too far; picking these things up at the grocery store three blocks down is pretty nice; I’m not complaining about commercial convenience!) I also had one three-cup size of hazelnut-flavored coffee and a glass of orange juice. I don’t know what it is about orange juice and me, these days, but suddenly there is no more delicious thing on Earth. Orange juice is the nectar of the gods! I can’t get enough of it. Maybe due to the flu my body is craving Vitamin C, which I haven’t been so good about taking this time. But the natural source of it is probably better than a pill, anyway. Regardless of the reason, I have become “a pregnant woman and pickles” about orange juice. I spent the rest of the day yesterday combing through dozens of websites, trying to find the ideal combination of “mountain lodge in the snow” that also offered a huge Christmas brunch (that I could afford), or, failing that, some other potentially beautiful fun place. While I found lots of possibly good places, none of them quite hit the mark I was searching for. I tried Big Bear Lake, Yosemite National Park, and Idyllwild (in the mountains above Palm Springs), all of which do have snow, but then I worried about the drive getting INTO those places (not quite so eager to slide my Cadillac off the side of a mountain or get it stuck in a snow drift just for a Christmas dinner in the snow). If I were going up for a weekend of skiing or snowshoeing, that would make more sense. So instead I tried Disneyland, which is definitely open on Christmas Day, from 8 AM to midnight—but then discovered that is the single most crowded day there in the whole year. So next I tried the Danish town of Solvang (that was the best bet financially), and The Festival of Lights at The Mission Inn in Riverside (one of my favorite hotels in the world) and THAT made Solvang pale in comparison, but realistically, it was just too expensive to enjoy all by myself, so ultimately I hung up the whole idea and went to bed. My sister definitely sounds like someone who could benefit from a Bluetooth cell phone connection to her car radio or some such technology. Maybe her fiance will give her one for Christmas. So she hadn’t hung up on me, but had been incommunicado for a day, until she managed to find where the phone’s battery had hidden itself. She had also been depressed and crying, though (she told me), for reasons I wrote about yesterday. I definitely do understand. She’s going to have a quiet Christmas with her two kids, just the three of them in their beautiful house on the lake. I think that will be wonderful and probably better than a noisier and more crowded “family thing”. Since she’s in that mood (and I think I am, too), I am guessing that my brother and his wife are also wanting the same thing. This will actually be the first time they will have had Christmas in their beautiful Las Vegas house, and I imagine them being like a honeymooning couple, which they deserve, because they so brilliantly help so many other people with their weddings. And as for my other sister, she wouldn’t have ever joined the rest of us for the holidays if our parents didn’t more or less make her come. Now that they’re gone, so she is she. I decided this morning that I wasn’t going to let nostalgia and sentiment ruin this Christmas break, and running around like a chicken with my head cut off in trying to make this one day into something that I remembered from the past was a bit silly. Instead, I should work on making the whole break into something fruitful, STARTING with Christmas Day. I was strongly reflecting on that beautiful slogan that had been on the Grove Park Inn site, “Over nine decades of history. It’s time for your story now.” That’s MY responsibility, and nobody else’s. Right now, I’m planning on cooking my own Christmas dinner for tomorrow. I am going to enjoy my personal setting and location and make it into something nice—a task that will take the whole of Christmas break and beyond, but now is the perfect time to start. Have a Merry Christmas, everybody!